After a bit of a “hiatus”, ClimateDialogue (CD) has re-opened again with a discussion on climate sensitivity. On the one hand this site is unique in bringing together ‘mainstreamers’ and ‘contrarians’ (both in the organization and in the discussions), hopefully leading to both enhanced clarity on what the (dis)agreements are really about and to decreased polarization. On the other hand it’s controversial because a ‘false balance’ is embedded in its structure (by purposefully inviting contrarian scientists to the discussion, rather than e.g. randomly inviting experts). There are similarities between ClimateDialogue and ClimateChangeNationalForum (CCNF, with which I’m also affiliated) e.g. in trying to make scientific discussions visible to the public, though there are also important differences. E.g. CCNF has a more open discussion structure, whereas CD has moderated discussions between a smaller set of invited participants. At CCNF the set of science columnists is more reflective of the scientific spectrum of opinion than at CD (though CCNF has also been criticized for “amplifying nonsense”; see also the recent discussion at CCNF itself). This post has also been published on CCNF. This entry was posted on May 15, 2014 at 21:38 and is filed under Climate science, English. You can follow any responses to this entry through the RSS 2.0 feed. You can skip to the end and leave a response. Pinging is currently not allowed. Let me emphasis that I did not complain about false balance. Before we get another discussion of Climate Etc. quality. My complaint about the CCNF was about the format of its “fact checker”. My reservations were apparently shared by the CCNF community, as the problem was largely resolved. I do not like term false balance that much, it suggests that the problem is numerical, while I feel the problem is more on of quality, of the inappropriate formats used to present climate science in the mass media. One remaining complaint about the CCNF is that you need a Facebook account to be able to comment and I prefer not to have one. Thanks for the clarification, Victor. Of course the issue not numerical per se, but the weight of evidence probably translates in a certain numerical division of scientific opinions. After all, it’s not a coincidence that most experts agree that smoking increases the risk of cancer; that’s a direct result of the weight of evidence leaning heavily to that side. The societal relevance of properly communicating the existence of an expert consensus are underscored by e.g. Maibach et al. Bart, I would guess that I have more posts the last year about climate pseudo-sceptics and their ideas as I have posts about science. It could be similar here. Not? I do not see that as false balance. The problem is the format. The fake debates, which are not suited to improve scientific understanding, and the presentation of fake experts as credible ones. If a quarter of the American public does not accept climate change, why not spend a quarter of the time on that? Possibly even more because it is interesting and these people are a political liability for the USA. When I just write about science, I have a lot less readers as when I write about climate sceptics and then explain how it conflicts with the scientific method or why it does not fit with our understanding of the climate system. Why shouldn’t media use the same trick to get people interested in science? People like controversy. That is something we cannot change. The problem is that you should not just leave a climate sceptic run his Gish Gallop or go unchallenged. But a program that picks up one of their talking points and gives space to discuss the evidence for and against it in sufficient detail would be fine. I;m the Founder of the Flat Earth vs the Round Earth Society. We will debate calmly and intelligently. Be the first to sign up here. You think it’s bigger than the measurements? You can look this stuff up, but youtube isn’t the place to go. 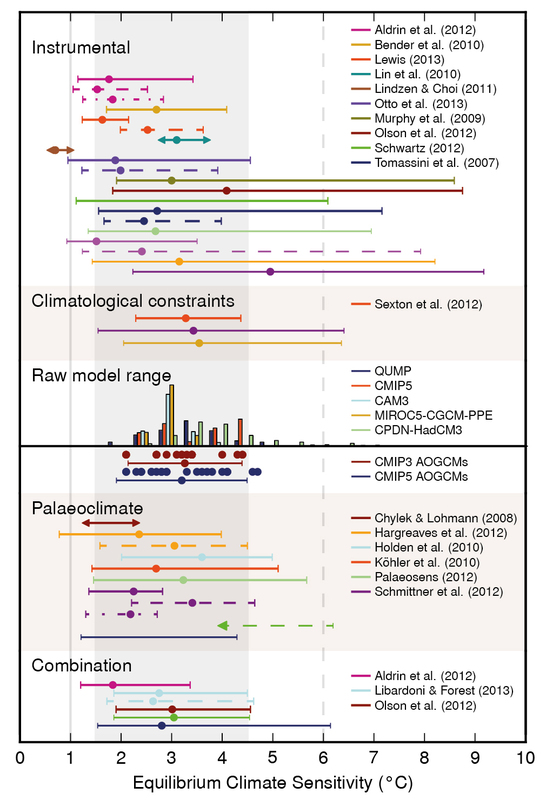 Question for Bart and other scientists — is there an assessment of the paleo climate sensitivity vs. contemporary looking at what difference the contemporary rate of change may make in the sequence and kind of events? I’m thinking of ocean pH — which is changing fast because CO2 is changing fast, vs. paleo times when a much slower rate allowed the slow step in the ocean’s chemistry to convert dissolved CO2 into other compounds about as fast as it was forming (so pH didn’t go up rapidly). I think that’s established chemistry. Wondering what other sequences of events might take different — significantly different — pathways, with the contemporary rate of change vs. the paleo. 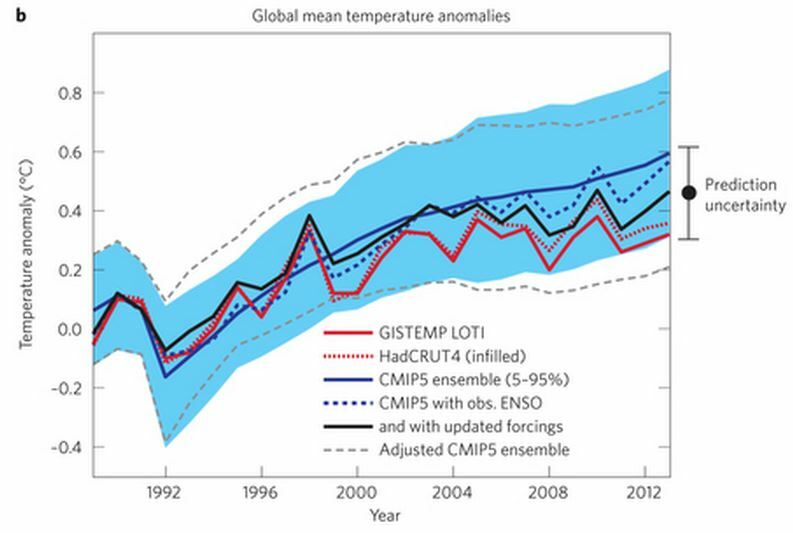 That would I think make climate sensitivity different this time? Nic’s work is quite thorough and in my experience, unbiased unlike much of what passes as science these days. If there is no more serious critique of his work than pithy non-sequitors about uncertainty, I would suggest all of you pro’s who might read this, dig into Nic’s work more deeply. Anyone’s preference for instrumental observation over modeled data or noisy paleo data that might have a temperature component, is simply scientific common sense. Something apparently missing in much of the world these days. Schmidt 2014 doesn’t even deserve reference in a blog post. > [U]nbiased unlike much of what passes as science these days. Did you know we spent nearly 200 million dollars on climate education for minorities – which means anyone not white male. Well funded skeptics — Bah!! The political nonsense drives me crazy but when people cannot parse what is happening to Iraq, taxes or windmills, how can we truly be serious about climate discussions. Even Steve McIntyre’s latest expose on yet another hockey Schtick paper isn’t enough to give me blog energy. So the Air Vent languishes nearly unused. Thank you for the accurate quote. It is way off topic for this post though. > It is way off topic for this post though. Unbiasedness is quite off topic indeed. Given the solved amount of CO2 in the oceans is about 38000GtC and about 100x that amount being in direct balance with the oceans in the sediments, in your opinions how much change can come with additional 100GtC per year? 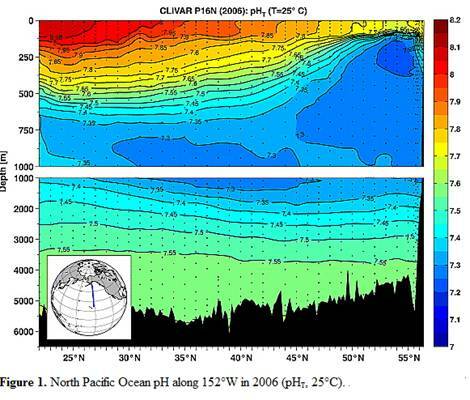 So ,would you kindly clarify, if indeed the ocean pH or only the sea surface pH is changing? I think, that you and other climate alarmists are well aware, that not the oceans, but only the sea surfaces show a slight pH decrease, for reasons which are quite a bit more uncertain as usually communicated and even if a oceanic increase in CO2 were possible, it only would lead to more CO2 extraction per calcification. Please help fighting false alarmisn, by calling things by the right name.. there is no measured “anthropogenic change of the ocean pH”! Perhaps Laws of Nature can explain to us how a map of measured pH can help determine where a change in pH has been observed? Clearly Laws of Nature is also unaware that a pH difference of 1 unit comes down to a factor 10 in concentration. And Laws of Nature is unaware that single-paper fetishes, like the one of Iglesias-Rodriguez, is unwise. With a bit of skepticism, he/she would have found out that there are many more papers out there that don’t support the findings in that one paper (reviewed to some extent in Benner et al, 2013).